Recent media histories have often said that a factor contributing to Red Hook’s decline was the construction of public housing, the New York City Housing Authority (NYCHA) houses. According to our research, the new NYCHA housing was seen as a huge improvement by its first residents and many in the area. 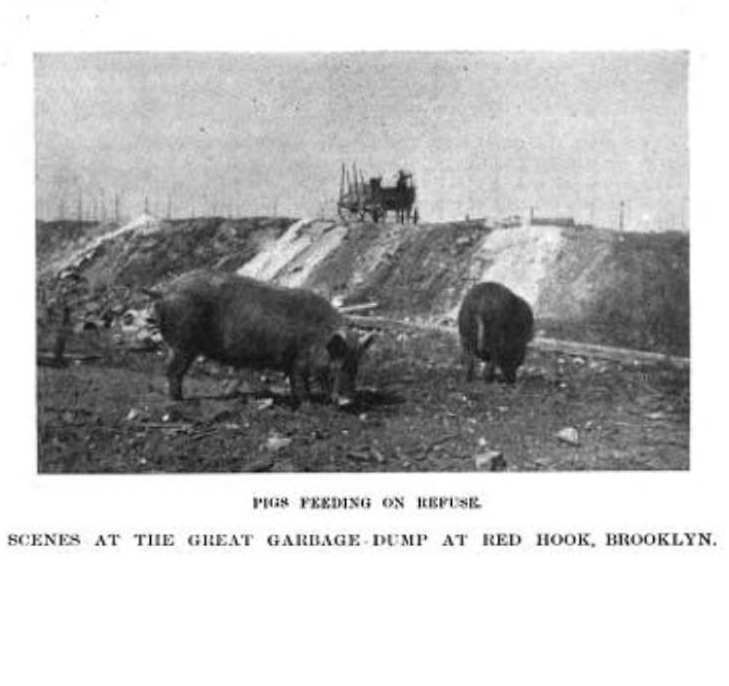 That’s because shantytowns had covered large swaths of Red Hook – including parts of what is now the NYCHA development, the Parks ballfields and pool. Historic map showing that much of Red Hook NYCHA houses (white lines) was originally under water. 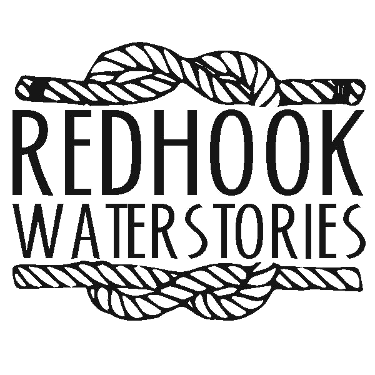 Much of the current landmass of Red Hook was originally marsh or outright water, and it wasn’t all filled until the early 1900s. Shantytowns, NYC’s original low income housing, were clustered along much of that damp rim for some 80 years. Much of NYCHA housing citywide is on that kind of land -- as NYC was reminded when superstorm Sandy floodwaters submerged many former marshes and hugely damaged NYCHA developments. Map showing the Red Hook NYCHA houses (grey lines on red background) and Red Hook's original coast line. A concentration of do-it-yourself-built shelters describes Red Hook shantytowns of the 1800s The shanties were clustered in an organic pattern without a street grid or paved roads, with no public services such as street lights, water or sewer. Shelters were ramshackle to modest. 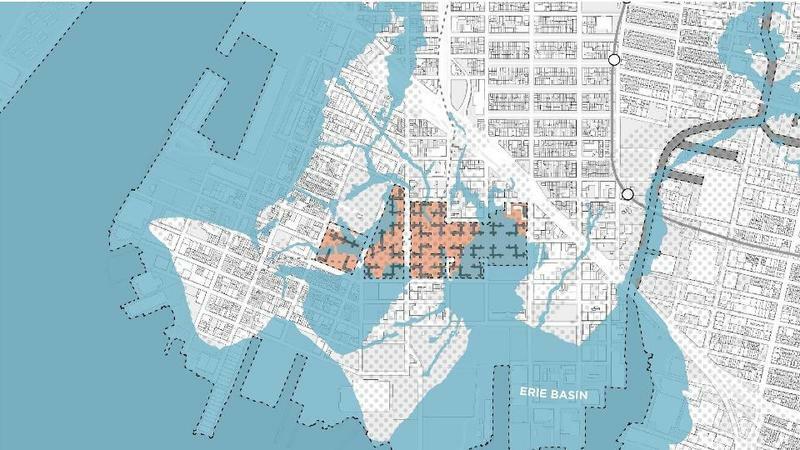 Erie Basin. Typical do-it-yourself shanty building. Photo by Jenny Young Chandler from The Henry Ford digital collection. Shanties were agglomerated in what we would now call “mixed-used” districts. Trash or dumping often occurred within or around the site since residents were the early recyclers of the pre-Sanitation Department era. There was work of an industrial flavor such as metalwork and scrap metal collecting, rag sorting and processing offal as well as activities we now think of as rural with flocks of chickens and herds of pigs, goats and dairy cows. What we now call “urban ag” was essential to NYC’s urban shantytown poor throughout most of the 1800s. Add a few taverns and boat rental joints; and it was a recipe for lively and rough places where crime was no stranger. Shantytowns grew as Red Hook rapidly transitioned from a bucolic landscape of marsh, tide mills, cornfields and orchards due to the 1840s construction of Atlantic Dock, a booming maritime facility that lives on in today’s smaller, quieter Atlantic Basin. Red Hook then urbanized with the addition of enormous maritime facilities and related warehousing and manufacturing. Residential developments were also built; but shantytowns continued, especially along the Gowanus Bay side of Red Hook, though there was one just north of Visitation Church. 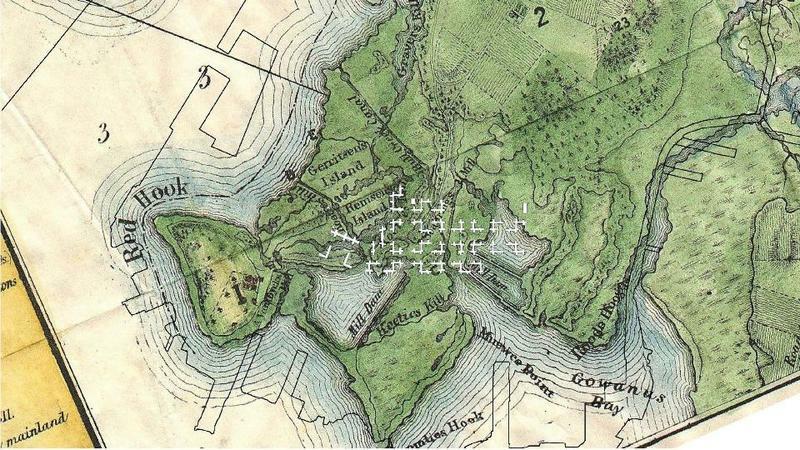 Red Hook’s western edge was all deep water ports, shipyards and related warehousing. Shantytowns were part of the economic system, in Red Hook, as elsewhere in 1800’s Brooklyn and New York City. Commercial guides on how to build a shanty were available. In the Red Hook and Gowanus area, residents were paying “ground rent” for use of the land; they were not squatters. In one case, a company built shanties as part of their strike breaking efforts: during the 1840’s construction of Atlantic Dock, the Irish building Atlantic Dock went on strike. To break the strike, the Atlantic Dock Company imported two shiploads of workers from Germany! This led to a riot between the Germans and the Irish. The Irish lost, and the Atlantic Dock Company built houses they called shanties for the German labor. For many residents, shantytowns were a route up, a first home for new immigrants. 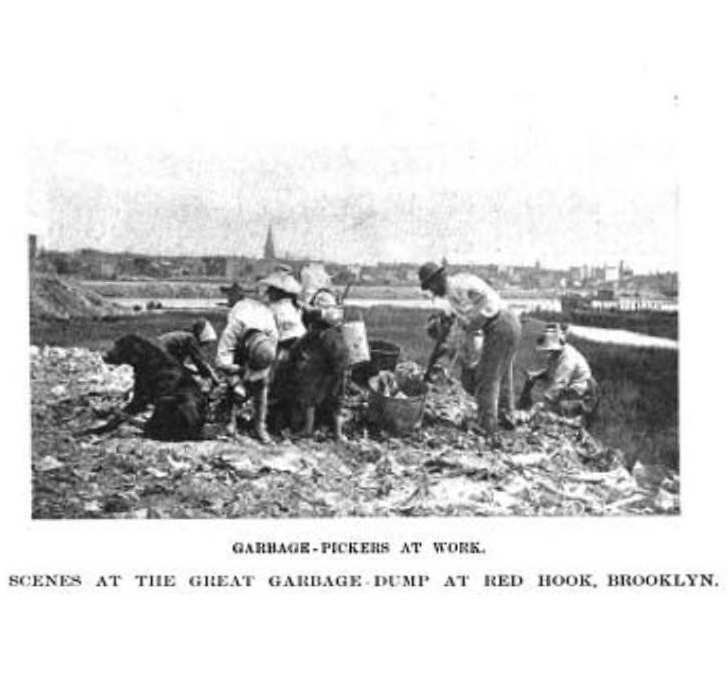 By the late 1800s, Red Hook had four Irish shantytowns and one German one. Like the “pioneers” who settling the American West, shanty dwellers moved onto open ground, built their own shelter, roughed it, saved up and built up while urbanity grew around them – but they didn’t own the land. Diegel provides the following modern equivalents: $30 per year in 1850 dollars works out to around $860 per year in today’s currency - without heat, toilets, running water, garbage removal, or landlord maintenance – and you have to build it yourself! Three such shacks could easily fit into the standard NYC Housing Authority 890 square feet apartment. The average Irish dock worker would have earned 6 dollars a week, ($172 in today’s dollars) with 10% of his income going in rent for the shack that could be on a flooding landfill. By providing an income stream on property that was at the time unwanted by any other segment of the market, shantytown residents contributed to the city's economy, plus the value of the work the residents did either within the shantytown or working in formal employment outside of it. Erie Basin. 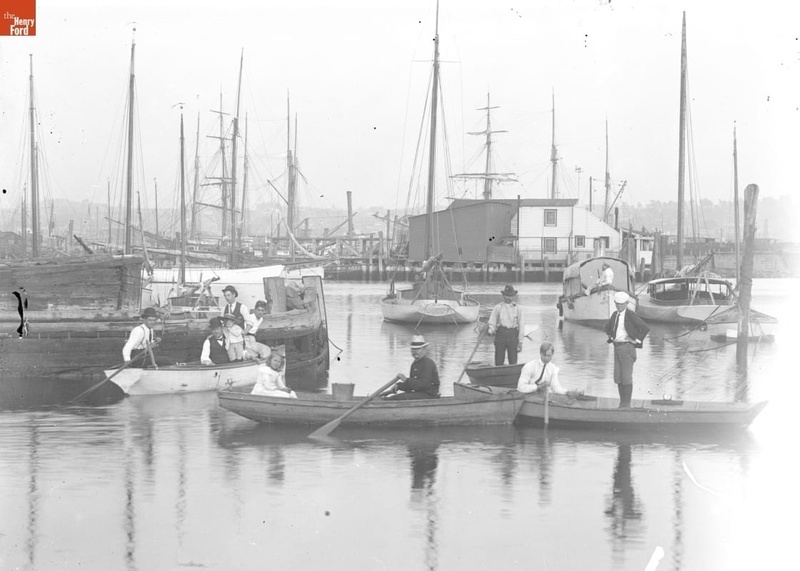 Note combination of shanty buildings, industrial waterfront (large ships), yachts (the white sailboats) and simpler rowboats. Photo by Jenny Young Chandler from The Henry Ford digital collection. Chandler photographed from the 1880s to the 1920s. Her images are not dated. To use post-Sandy language, Red Hook’s shantytown residents knew how to live with water. Some elevated homes on pilings. Some built dwellings on wheels they could roll away from high waters. Some accepted flooding. Some brought dirt from the leveling of Cobble Hill and raised their land. Paintings and photos of Red Hook from the 1880s to 1920s show flimsy wood buildings on stilts, surrounded by walkways on pilings and boats of all types. 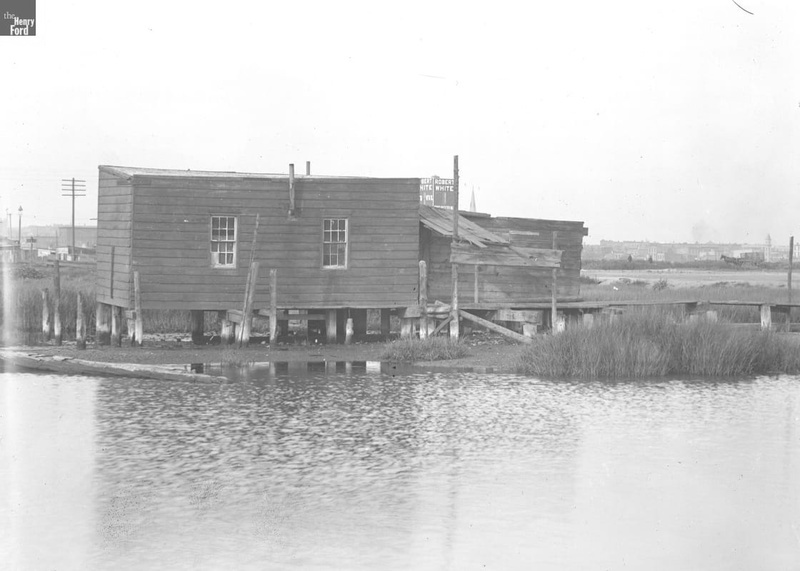 Vestiges of that kind of construction and living over and with water can still be seen in NYC with the stilt houses on Broad Channel Island in Jamaica Bay. 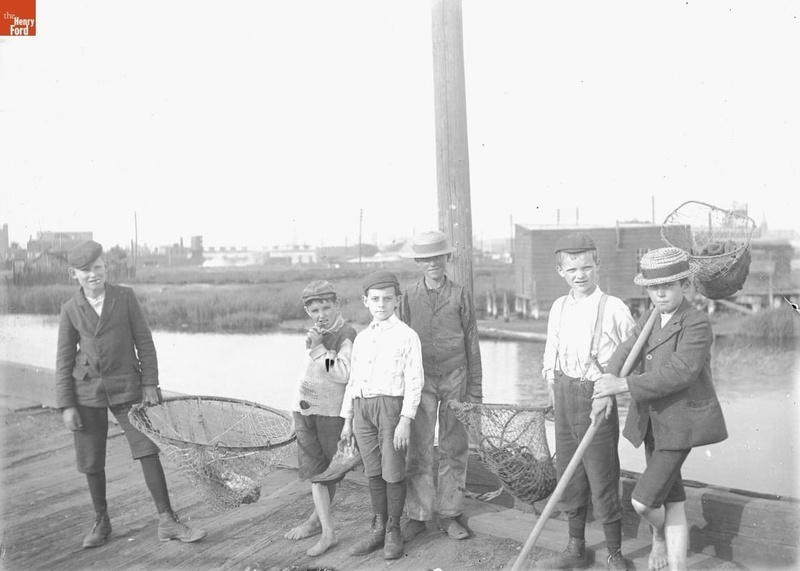 Young crabbers in Erie Basin. Photo by Jenny Young Chandler from The Henry Ford digital collection. In shantytowns, the waterways were also a resource. They provided food via fishing, oystering and crabbing, heat by scavenging for wood, and money by renting boats, or moving and selling goods by water. The waters’ edge was busy. By the 1870s, there were efforts to eliminate shantytowns by real estate developers, city officials, reformers, and social betterment organizations in Brooklyn. A similar effort was underway in in New York City which Brooklyn watched closely and finally joined in 1898. The goal was an urban grid with architecture built by developers. Rural life would be confined to man-made “natural landscapes” like those of Greenwood-Cemetery, Central Park and Prospect Park. The power brokers considered the architectural hodge-podge of shantytown and the “dirty” businesses and the livestock to be appalling. Shantytown residents were often derided in public meetings and the press with condescension if not revulsion. Our modern notion of an objective press does not seem to characterize 1800s reporting about shantytown folk. 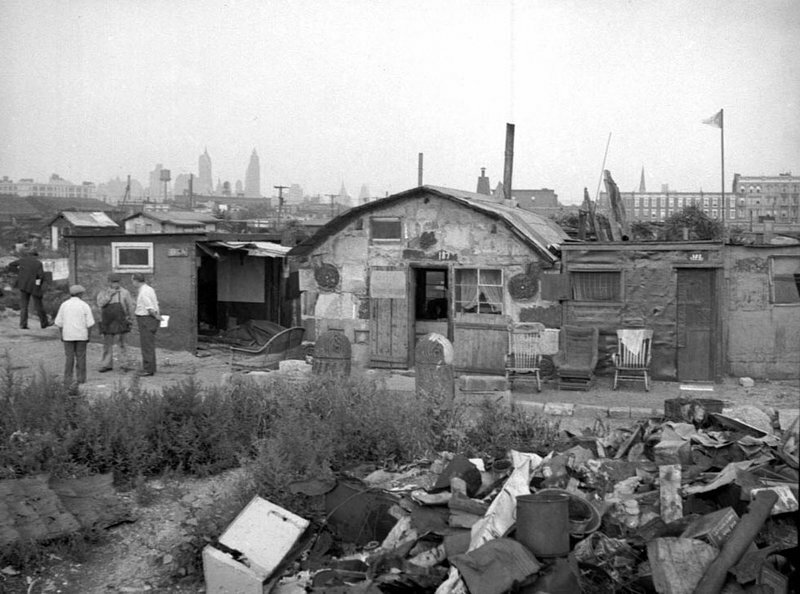 The battle to eradicate shantytowns took decades, and the poor fought back. Conditions in the Orkenun Sur shantytown were tough, but note the order of the rocking chairs in front of one shanty and the house numbers on the shanties. Residents' memories of better times made them strive for domesticity despite the rough conditions. By the 20th century, shantytowns were far fewer and often where people landed on the way down: the newly poor in the Hoovervilles of the Great Depression (named after President Hoover), or the early 1920s Norwegian seamen who were stranded in Red Hook due to a global collapse in the shipping industry. Those seamen ended up in a very rough shantytown they dubbed “Ørkenen Sur” (bitter desert) near the property currently called GBX, the adjoining baseball field on Columbia Street and the ballfields along what would be Halleck Street. The legacy of shanties and modest self-built homes exists in Red Hook on some blocks where the grid was not built up until well into the 1900s or where streets don’t meet at 90 degree angles because they were built around shanties. The shantytown legacy may also live on in Red Hook’s character. Shanty dwellers were tough, scrappy, independent folk who often fought the system or found the system fighting them – much as one hears in the tone of a public meeting about contemporary Red Hook urban planning issues. Eymund Diegel for a torrent of emails, meetings, maps and many data files. John Burkard, Red Hook’s self-appointed, self-taught historian who died in 2015.